New York, NY Over the weekend eighth-year senior Karl Krooks received a letter from Metro College denying his petition to count karate classes to fulfill the foreign language requirement. The decision could further delay Krooks� plans for graduation. �I thought I had a good chance. I mean I had to listen to so much foreign language that it should have counted. My karate teacher did not speak hardly any English. He went around talking Asian all the time,� said Krooks. According to friends and Frat brothers Krooks will most likely try to enroll in spring term intensive French for beginners. One Frat brother said that the French teacher was pretty hot and there might be some chances for �extra credit� to help Krooks pass. If Krooks is unable to pass French, his graduation will be delayed by at least another year. �I am not worried too much. 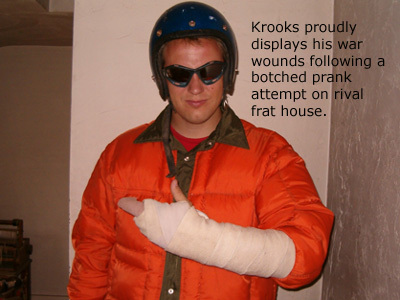 If I don�t pass I can just run for another term as Frat President,� said Krooks. Krooks is still eligible for 2 more terms as Frat president, per recent amendments to the Fraternity House charter, which had previously stipulated a one-term limit.